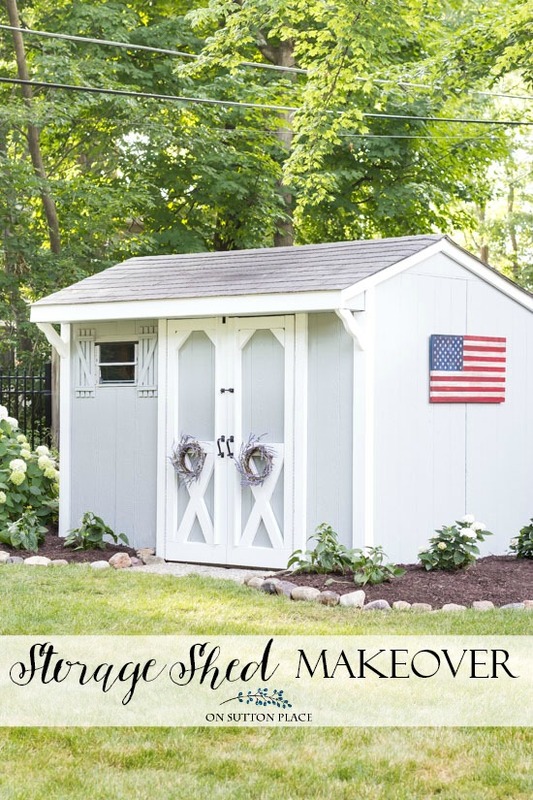 A shed doesn’t have to be an eyesore! 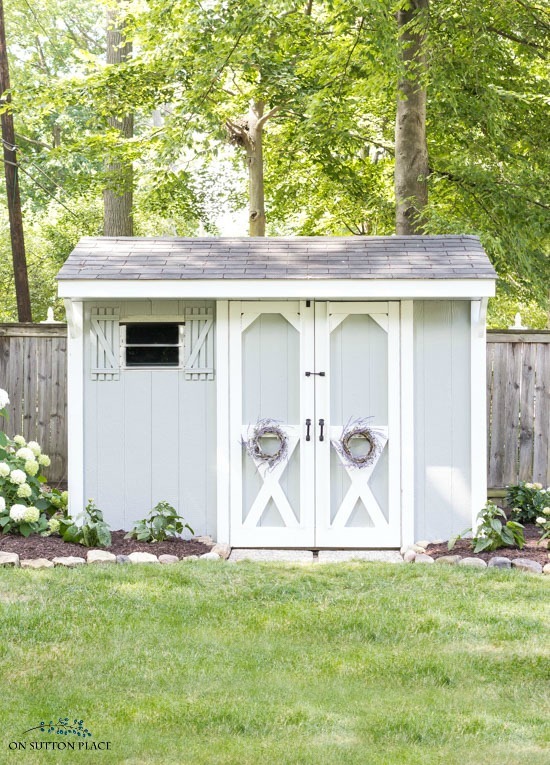 Use these outdoor storage shed makeover ideas to add function and charm to your garden. More often than not, when I start a project, I have no idea how it’s going to turn out when it’s finished. Over the years, I’ve had just as many failures as successes. My project for this summer was the storage shed in our backyard. It was here when we bought the house, which was 26 years ago. I’ve had it painted once, but that’s it. That paint job was faded and chipped, the doors were in need of repair, the pavers needed replaced, and the door latch was rusted. Basically, it was a mess. I didn’t have high hopes when I began my outdoor storage shed makeover, but it’s turned out much better than I expected. So without any further chatter, here is the before and after. This outdoor storage shed was in need of several repairs. The doors were rotted along the bottom so all that wood was replaced. The door hardware was rusted, so that was removed, along with the flower box. It was impossible to grow anything in that little flower box so it’s no loss at all. There was also a crack in the side of the shed that was screwed tight. Nothing makes more of an impact than a fresh coat of paint. This storage shed had been painted over ten years ago, so the paint was faded and chipping. The gray color is Sherwin Williams Morning Fog and matches the siding on our house. Shopping for the new hardware was very fun. I knew I wanted something decorative and black wrought iron if possible. I found the cabin latch first and then matched the handles. (All sources are listed at the end.) Thankfully, my dad came over to help install the hardware so I didn’t have to tackle that project by myself! 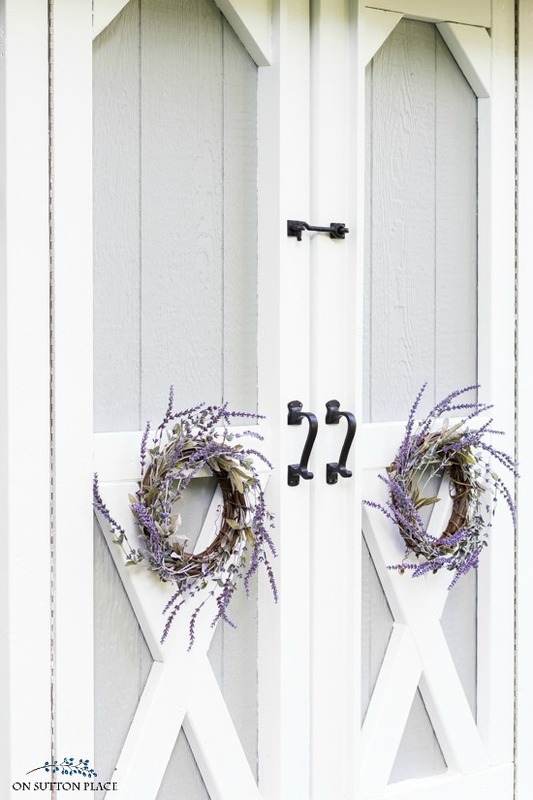 I can’t imagine any door without a wreath…so I made twin wreaths with faux lavender for the double doors. I wired them to sturdy nails so they won’t blow off. I think they are perfect. 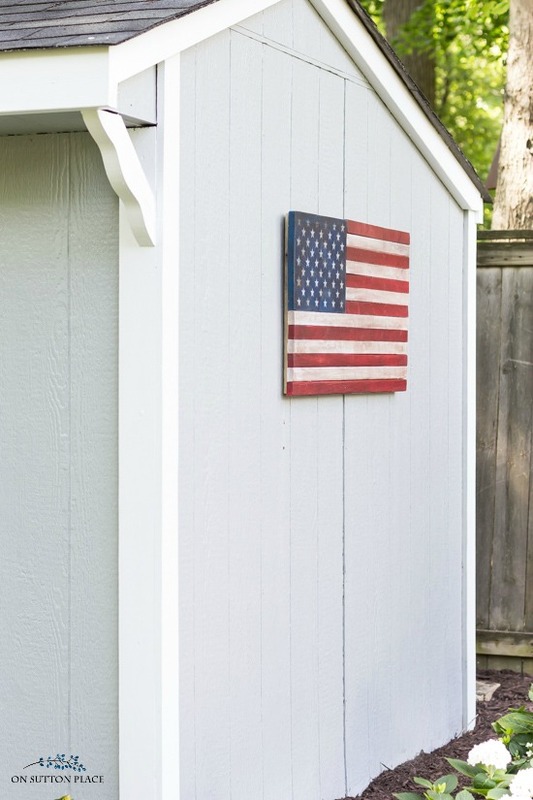 My existing flag was faded and rotted…sort of like the storage shed itself. I was going to try and revive it with paint, but decided a new flag was in order. I found this beautiful flag on Etsy and could not be happier with the quality. We hung it from a very large picture hook and then nailed each corner directly to the shed. It’s not blowing away either! I have never liked the cement blocks that were in front of our outdoor storage shed. They had sunk into the ground and were basically very nasty. I found these large 24 inch pavers at Lowe’s that were surprisingly inexpensive. I needed just two to clean up the area in front of the shed. New black-eyed susans and fresh mulch were the finishing touches. Like any project I do around here, this was a process. I first had to wait on a handyman, and then the painters. After that, I waited on a few relatively cool days to finish things up because I was not going to melt outside in 95 degree weather. From start to finish, this makeover took about a month, which I guess isn’t too bad considering there was quite a bit to do. subscribing to my email list. « Home Style Saturdays: Accessories, Basements, Bedrooms & More! Wonderful job! I looks elegant with the lavender wreaths! Ann, I love your shed makeover! Would you be willing to tell where you purchased the shed? I am in the market for one and really like yours. Looks nice !great job ! You must be thrilled with this Ann, it’s just perfect! LOVE your Potting Shed make-over!! I have been putting off re-modeling mine on our small Idaho farm. (In Way worse shape than yours!). But you have given me such Inspiration!! Great ideas that have given me some “direction”. It is beautiful! Thanks so much for sharing. Know you will enjoy it for yrs. to come. Everything looks Amazing! You have inspired me to transform mine in the near future! Especially Love the wreaths!! The shed looks great but I would like to know how to make the lavender wreaths since I have a garden gate and try to put a wreath on it. Now the shed looks dressed in it’s Sunday Best. The ground work looks great. What an inspiration! I look at my old shed differently now. Oh the possibilities!! Love the look of your new shed! What are the bushes that have the big white flowers along side the shed? I know it’s some form of hydrangea. Is it limelight? The bush on the left (as you are facing the shed) is an Annabelle hydrangea. It’s probably about 15 years old and some years it blooms…some years it doesn’t. This year I got lucky! Your shed looks fantastic. I have a salt box shed. We put a gutter on the back with a rain barrel. Absolutely amazing how fast that barrel fills up. Ann, your shed looks so GOOD now. I really like the new black hardware you added to the refurbished doors. The landscaping improvements also add a lot of “curb appeal” . Too bad your cute little shed probably can’t be seen from the street, however I’m sure YOU are enjoying it immensely now. Acutally it can be seen from the street! 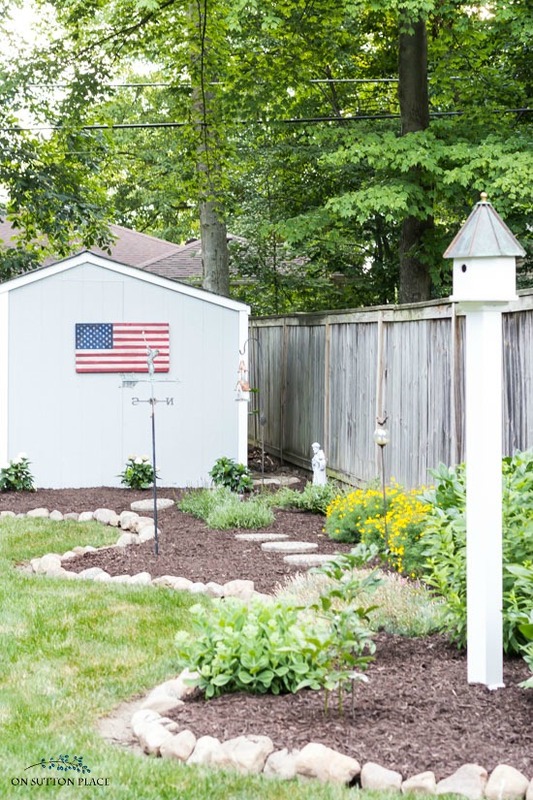 Not the front of the shed, but the side with the flag and the garden. I’m not sure I would put so much effort into it if I was the only one looking at it! It looks great Ann! Thanks for sharing it with us. Your storage shed came out lovely. It looks brand new! Our shed is beyond repair. It’s over 40 years old and should have been replaced years ago. When we get a new one I’m going to use ideas from your make over like the pavers in front and flower bed on the side to jazz up the area. Love the shed make-over! Would like the print out with the piano but can’t seem to find it. Hi Ann! Your shed looks wonderful and I agree getting projects done is always a process. Good job and thanks for sharing. So pretty! 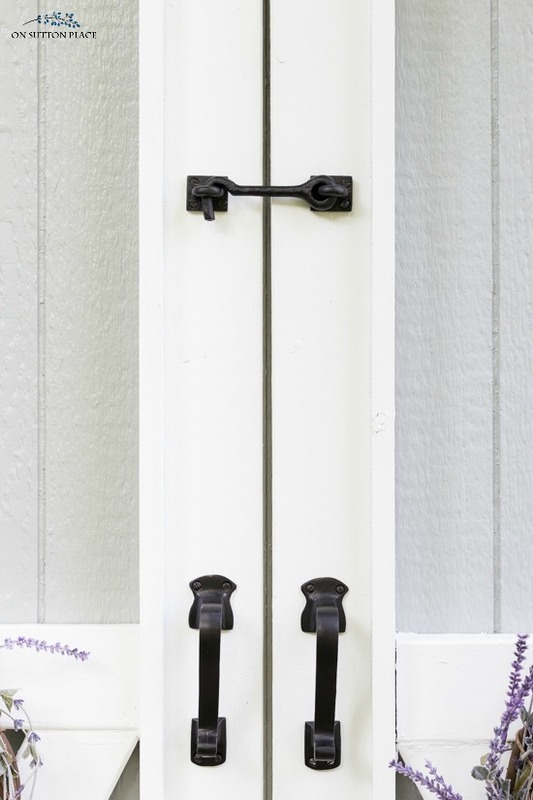 It’s amazing what a coat of paint and new hardware can do to spruce things up. I love the wreaths on the doors and the flag on the side! I love your makeover!! It is amazing how a few changes can make such a large impact on an area……the well manicured garden makes for a show place! Good Job. Love the color! It looks beautiful! The pavers are perfect! Invest in a gutter now and you will save on replacing future rot along the bottoms of the doors again. I thought about installing gutters and downspouts…but ran out of time and money. Maybe next year! 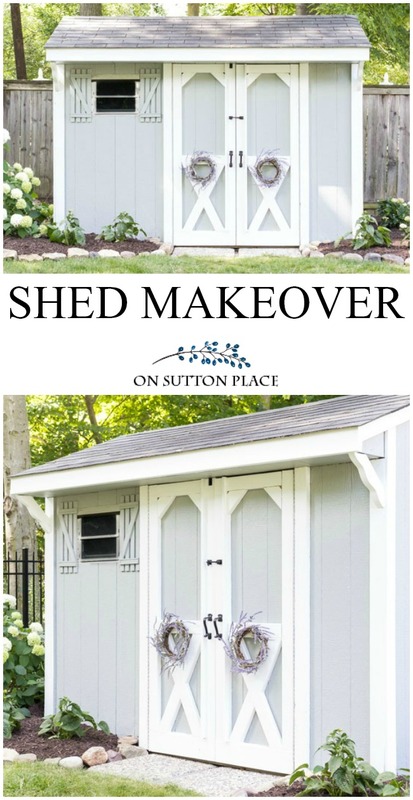 Love your shed makeove! Once again you have inspired me to take action at home, thank you! Nicely done! I love the updates that you did. The paint color doesn’t appear to have changed, but a fresh coat, plus new hardware and pavers makes it pop! It is beautiful! I love the color and hardware- everything! Your personal touches make all the difference. Thanks for the inspiration! Now I don’t feel so bad when it takes forever to get one of my projects done! Your shed looks really cute! I’m still waiting for my son to pull the guts out of a large TV console that I am going to make into a kitchen island. I especially like the handle and latch you picked out. I adore your website and information you provide us. Thank you for an interesting read! Okay, this is going to sound crazy, but I have very close to that same shed, right down to a wooden flag hanging on the end that is visible to the street. It never occurred to me to take the ugly window box off, but I will. I have it painted the same colors as my house, including teal with white cross pieces on the door. I love your choice of hardware and will definitely check into replacing mine. You’ve really inspired me to think about landscaping around it. Thank you Anne! Our flag is visible to the street too…and I love that so good choice! Your shed is adorable, Ann, I covet it! I know exactly what I would store in mine if I had it. However, with two full-fledged barns on our property, I don’t think I will ever have a cute little shed. Love the hardware, the wreaths, and they flag. They definitely set it off. It was a project that turned out beautifully, if you ask me! Your projects turned out very nicely! 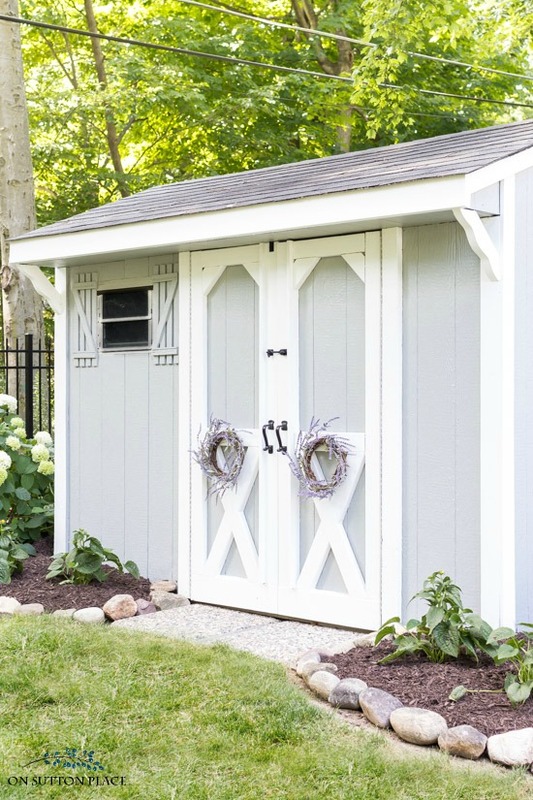 The shed looks clean and classic with a touch of country with the lavender wreaths. 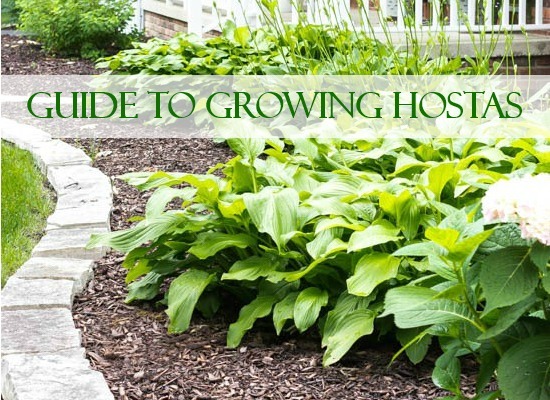 I love your hydrangeas and hostas! I have around 30 hydrangea plants. I just think it makes your yard romantic! Hydrangeas are just beautiful. Getting back to your projects, I like the gray color you picked with the white trim. The hardware for the shed is perfect. I also love wrought iron items. Just one other thing about your yard that I love is the curvy bed boarders. I love that! Overall, you did an outstanding job executing your projects. The flag is a wonderful touch supporting our country! Great and uncomplicated makeover, Ann! This was so fun! I wish our shed was inside our fence. Everything outside of it is, well, the woods :) Never thought about a wreath for the door. That is beautiful! Very nice. The color is just right with the black hard ware! Looks very nice i too also live in Ohio and we always try to extend our back yards into living space before winter sets in so we always want it to look good even sheds!!! Looks very cute, your back yard looks very cool. I think it is super neat and very pretty! Great job! It’s such a cute little building now. The landscaping beside it looks great too. I love the latch and handles too. 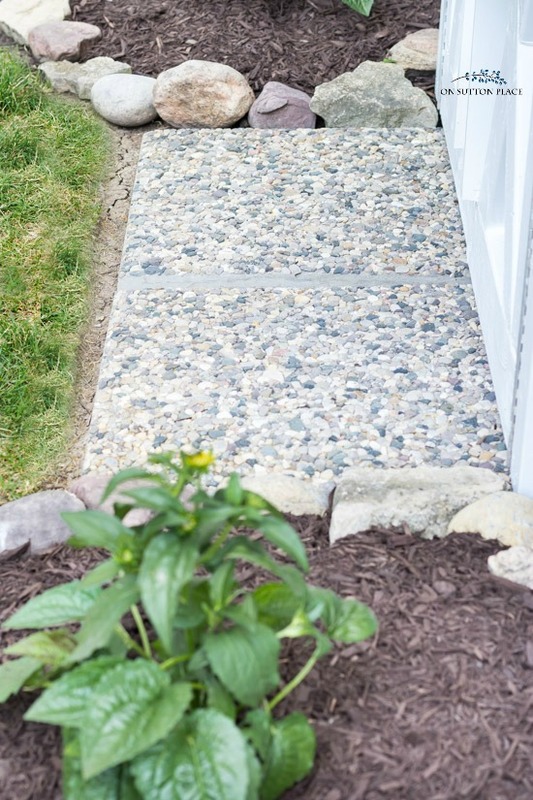 I just went back and looked closely at your stone pavers- I think they would be great on the side of my house in my pea gravel for a walkway- it looks like you laid them in cement? Or are they just laid firmly in the ground and it appears like its cemented? Hi Joleen! The pavers are actually sitting on plain dirt. It looks like cement because it’s hard as a rock. I am not an expert, but if your ground is somewhat level, I think the pavers will be fine with no real base. Thanks for answering- it will be a great fall project!! Simply adorable- and all those green trees- miss that since I live in Arizona!!! The shed looks so pretty – it must have been fun to do – Love it! Love your shed and all the improvements. It must feel so good to have this all completed. Great job. What a lovely clean up, Ann…you must be very pleased! 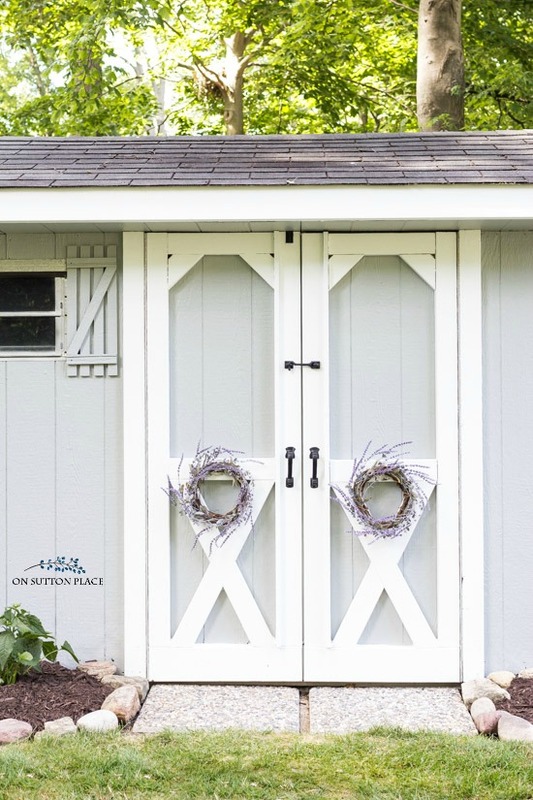 The shed looks so charming.The wreaths and the hardware are the perfect touch, nice job Ann ! Absolutely charming! “You did good”! 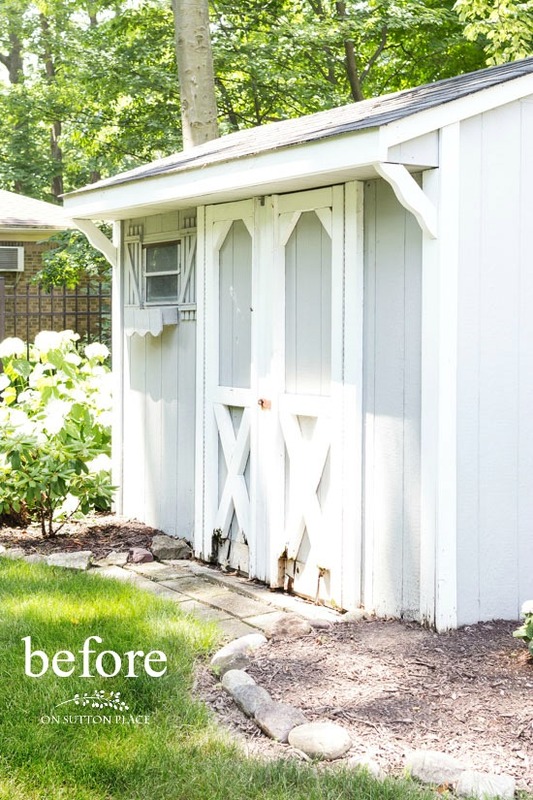 Your shed is so pretty in her new paint and with new hardware (jewelry). It’s wonderful! Thanks for the ideas! I think your shed color is a personal choice and definitely doesn’t have to match your house. My shed is visible from the street so it looks more cohesive with the matching paint. 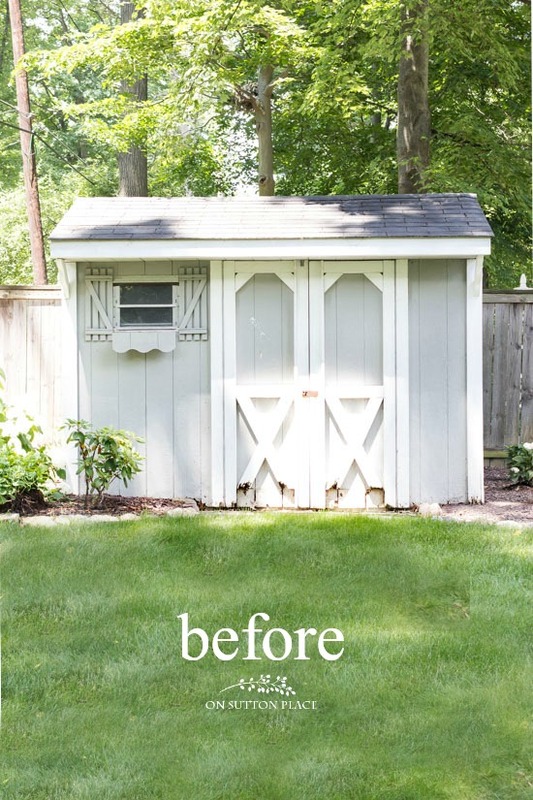 Since your roof is gray, your shed could be white or a lighter gray. Just an idea! Beautiful makeover! Your project looks very clean, classy, and timeless! I love the new repairs and additions to your shed. It is a great job, one I have grown used to you sharing. I have a shed which has been completely redone in my backyard. My husband completed the inside for me for my crafting. I design silk flowers and make homemade cards there too. I love my shed! Oh you have a She Shed! You are a lucky girl…enjoy! Looks lovely Ann…love the wreaths on the door.Can never go wrong with black wrought iron.Another project …done and completed!!! Hi Ann, your shed looks just beautiful and I love it! I truly enjoy your projects AND your recipes. Last month I made your recipe for pineapple ice box cake and my husband wants me to make it again. Other people had heard of ice box cakes but I have not. Super easy. Thank you for taking the time and thank you for your creative gifts and sharing with us all. It is soooo cute! Great job! So clean and inviting! When I was a little girl my best friend from the house behind ours and I would empty my father’s shed regularly to make it our dressing room since we were circus stars on the swing set. That set me off on a love of garden sheds. Were I six I would be begging to make it mine! Love this makeover, Ann! So fresh and pretty. I’m sprucing up our shed this summer, too. Just added two window boxes, in fact (haha!). Thanks for sharing the inspiration! Great job! Thanks for all the info and especially where everything was purchased. Really pretty! I Love projects like this. Looks great. I’ve redone our shed in the spring. I even put an old window on the side. My mother always said I could make a silk purse out of a sows ear. amazing… would love to start changes to my husband’s workshop….